I was pretty excited to learn that the brand new HBO series Game of Thrones was largely filmed in Northern Ireland. Until the last decade or so no films were made in Ulster because production companies couldn't get the insurance to do so. All those cheesy movies about the Troubles were usually filmed in Manchester, but all that has changed since the Good Friday Agreement and the influx of Hollywood money has been part of the peace dividend. The interiors for Game of Thrones were shot at Paint Hall studios in the Belfast docklands but I was even more interested to learn that many of the exterior shots were filmed in rural Northern Ireland. Filming locations included Carncastle, Shane's Castle, Magheramorne and Tollymore Forest. Carncastle is a wild mountainscape overlooking the Atlantic, it's an area I know extremely well having camped and hiked there. Shane's Castle is a working castle still inhabited by a minor member of the royal family - I've visited Shane's Castle on several occasions. Tollymore Forest I've been to hundreds of times. I even made a Super 8 swordfighting movie there with my little brother. (Hopefully the production values for Game of Thrones are slightly better.) Magheramorne is maybe the most surprising filming location for me. My dad was from Magheramorne and its basically just a village with barely more than a dozen houses in it. I assume they filmed not in Magheramorne village itself but in the abandoned quarry nearby which juts into Larne Lough in pretty spectacular fashion. 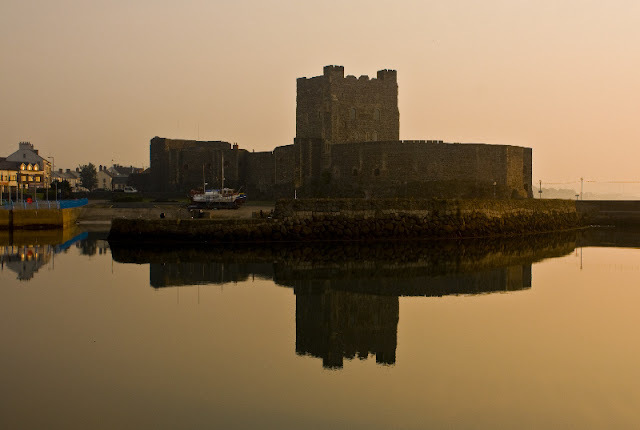 If Game of Thrones is a hit maybe HBO will do more of George RR Martin's books and perhaps they'll use Carrickfergus Castle next time (above). I literally was born and grew up a stone's throw from Carrick Castle which is the best preserved Norman structure in Ireland. The keep is over 800 years old and the outer walls date from the thirteenth century. It's an amazing place. When I was a kid I was in the local archery club and once a week we would set up the targets in the middle ward and shoot our composite bows in there - yes it was as cool as it sounds. I haven't seen Game of Thrones yet (I have read the books) so if anyone has seen a preview copy or the actual show I'd love to read your review in the comments below.